Juventae Chamsa is a large canyon near the Valles Marineris canyon system in the equatorial part of Mars� western hemisphere. Valles Marineris is about the size of the Mediterranean Sea if it were emptied of water; it would span the length of the United States! Juventae Chasma is about the size as Lake Huron if it were empty � but Lake Huron is not nearly as deep. This 2.5 kilometer high mountain on the canyon floor is a remnant of sedimentary rocks that were once more extensive, but have now been reduced to eroded mounds. Like sedimentary deposits elsewhere in Valles Marineris, they are rich in sulfate minerals. Two major classes of sulfates are seen here, distinguished by the amount of water bound into the sulfates� crystal structures. Monohydrated sulfates (with one water molecule per sulfate molecule) are shown in yellow, and polyhydrated sulfates (with multiple waters per sulfate molecule) are shown in magenta. These complex, layered, sulfate-bearing deposits appear throughout the enormous Valles Marineris canyon system. The different kinds of sulfates form under different environmental conditions, with polyhydrated sulfates requiring a wetter environment than monohydrated sulfates. Some scientists studying these rocks think that the layering of different types of sulfates records a changing environment of sedimentary rock deposition. Disclaimer: Colors shown here represent indicators of mineralogy and are not what the human eye would see. 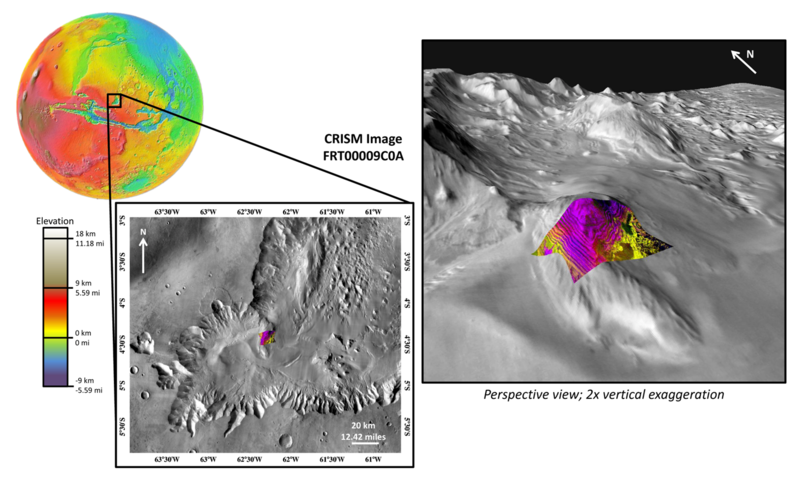 Acknowledgements: THEMIS, MOLA, CRISM, Google Earth.